Geweldige ligging. Klein appartement, voor vier personen goed te doen. Heel vriendelijke ontvangst. Situated in the picturesque Eixample neighborhood , this stylish two-bedroom apartment in Barcelona is located close to some of Barcelona´s most revered sights, including Gaudí´s Sagrada Familia. You will also find some fantastic bars, cafés and restaurants lining the surrounding streets, meaning this locale is perfect for anyone looking to experience all that this great city has to offer. The apartment can accommodate up to six people in total. The apartment welcomes guests upon arrival with traditional touches throughout, including dark, wooden parquet flooring, open-faced brick walls and French windows.. The living room is furnished with a comfortable sofa, and a TV, perfect for relaxing after a day of sightseeing. An Internet connection is also available, making it easy to stay in touch with friends and family back home. The well-equipped kitchen has plenty of the utensils and appliances needed to create your very own home-cooked meal, or try your hand at some Mediterranean inspired dishes. The apartment has two bedrooms, both furnished with two single beds, as well as one bathroom, fitted with a walk-in shower. 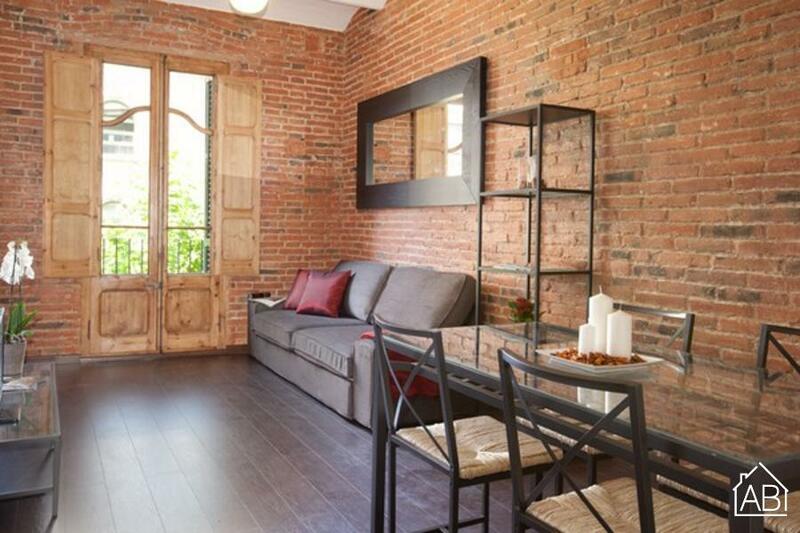 Located in one of Barcelona´s most beautiful neighborhoods, and with easy access to all of the city´s sights, this lovely apartment, complete with heaters and air-conditioning, is the perfect choice for your trip to the Catalan capital any time of the year!